This Lightning Custom has a beautiful one of a kind tribal gel-coat that is a real eye catcher. 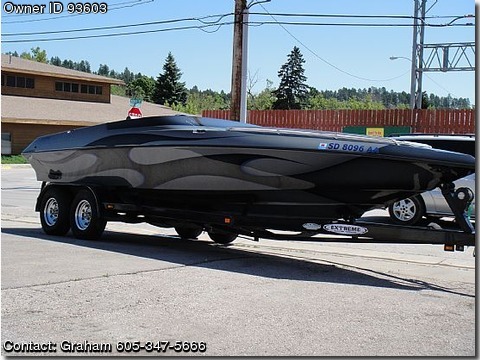 Its fitted with a 496mercury with a bravo1x outdrive.It has Lavorsi contols with Beede chrome gauges. It has has a mid-cabin and Pioneer stereo throughout. dana exhaust and dana marine hardware through out. It has 105hrs an motor and has K&N airfilter on it. Oil changed every ten hours and was Detailed twice a year and buffed. This tribal rocket hits 72mph and sounds awsome! full boat cover also.